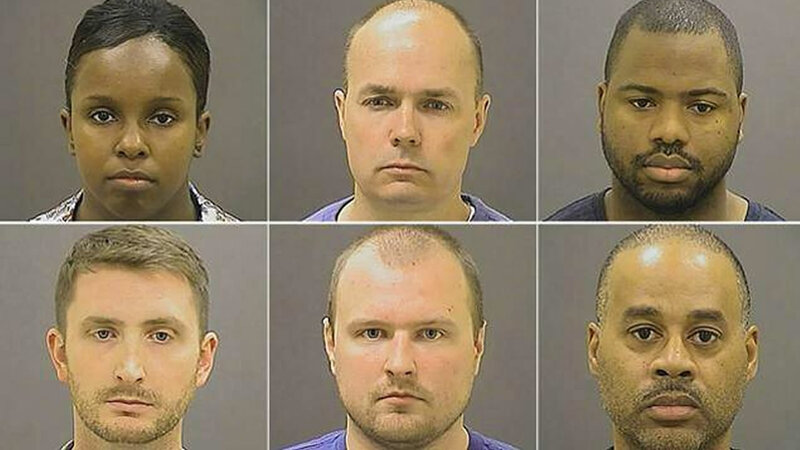 BALTIMORE, MD -- A grand jury indicted all six officers charged in the case of Freddie Gray, who died of injuries he suffered in police custody, allowing the state's attorney to press ahead with the most serious charges despite criticism that she was part of an "overzealous prosecution." The indictments announced Thursday were very similar to the charges Baltimore State's Attorney Marilyn Mosby announced about three weeks ago. The most serious charge for each officer, ranging from second-degree "depraved heart" murder to assault, still stood, though some of the other lesser alleged offenses had changed. Gray suffered a critical spinal injury after police handcuffed, shackled and placed him head-first into a van, Mosby has said. His pleas for medical attention were repeatedly ignored. Mosby said prosecutors presented evidence to the grand jury for the past two weeks. Some of the charges were changed based on new information, but she didn't say what that was. She also did not take questions. "As is often the case, during an ongoing investigation, charges can and should be revised based upon the evidence," Mosby said. In all, three of the officers had additional charges brought against them while three others had one less charge. Attorneys for the officers have said in court documents they are the victims of an "overzealous prosecution" riddled with personal and political conflicts of interest. They said at a minimum, Mosby should be replaced with an independent prosecutor because she had a personal interest in calming unrest in the city that followed Gray's death and because her husband is a city councilman. Two officers, Edward Nero and Garrett Miller, were indicted on second-degree assault, misconduct in office and reckless endangerment. "I'm very glad that the grand jury chose not to indict officer Nero on false imprisonment and one count of second-degree assault. I'm quite confident he will be acquitted of the remaining charges at trial," Nero's defense attorney Marc Zayon said. Caesar Goodson, who drove the transport van, faces manslaughter and a second-degree "depraved heart" murder charge. Sgt. Alicia White, Lt. Brian Rice and officer William Porter are each charged with manslaughter, second-degree assault, misconduct in office and reckless endangerment.